The smell is amazing, and has filled the kitchen. I had to get a sweater out of the closet. The day I made this it was cold and dreary. The rain moved in around noon and pretty much made doing anything outside a write-off. It’s not so much the rain. I’m not made of sugar (I won’t melt)... It’s the single digit temperatures that moved in with it that was really depressing. In the middle of the afternoon! The oats, after about 30 pulses, or thereabouts. Brrrrr. I even moved the plants on the back deck into the sun porch. Just in case. There’s some important ones out there, plants that remind me of special times in my life. Since I couldn’t pick up all the fallen apples (dodged a bullet there) I moved my activities into the kitchen. To the bread bowl. I’m getting back into bread now that turning on the oven doesn’t over-heat the house. In fact it actually drove off the chill in the air. Bonus. This bread is pretty straightforward. 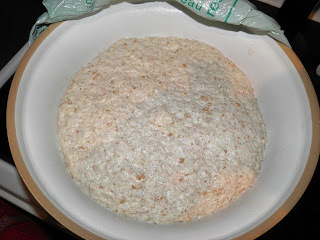 It’s a low-knead bread with the addition of some healthy steel cut oats and honey. I’m sure it will make some very fine sandwiches through the week. 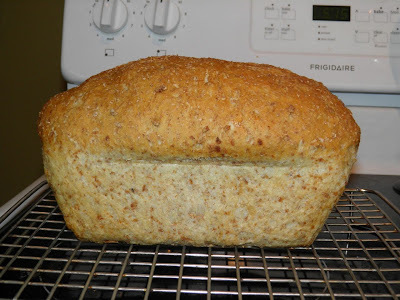 If you like oatmeal bread you might want to give this a try. This recipe’s different from most in two respects. First, it substitutes honey for oatmeal so it’s a light coloured loaf, and the amount is half as much as usual, so it’s not overly sweet. It is now cooling on the counter, crackling away as it cools. Ahh, the sounds of fall... at least some of them aren’t bad. Proof the yeast in the warm water and honey until bubbly, about 10-12 minutes. 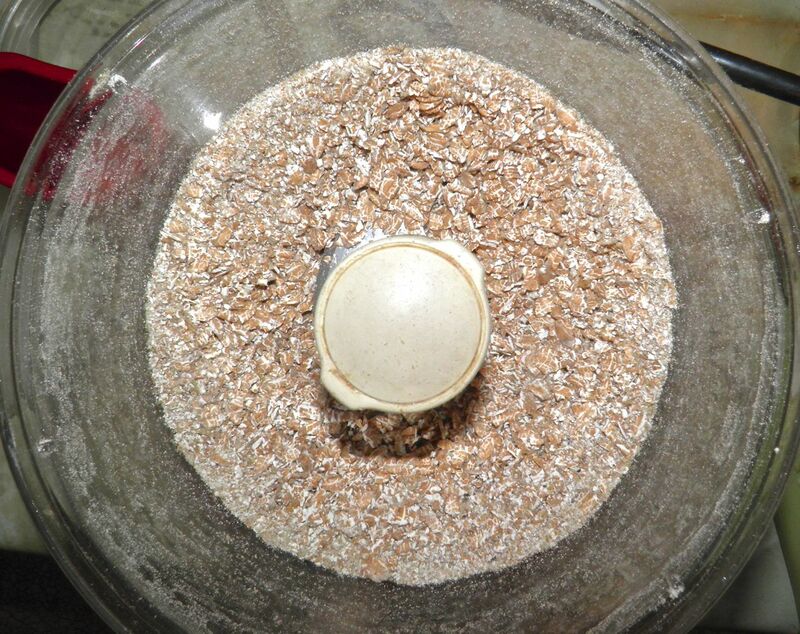 Pulse the steel cut oats un a food processor until broken up but not ground to a flour consistency. You want pieces. 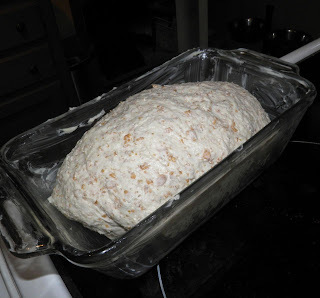 Place the dough back in the bowl, cover with plastic wrap and then a towel. Let rise in a warm place until doubled, about 2 hours. Generously butter a 5” x 9” loaf pan. Set aside. Punch down, knead briefly, shape into a log and place in the buttered pan. Let rise until doubled again, about 1 hour. For the last 20 minutes preheat the oven to 425°F with a pan of water on the bottom rack. Bake the loaf for 10 minutes with the water bath. Remove it and then bake for an additional 30 minutes. 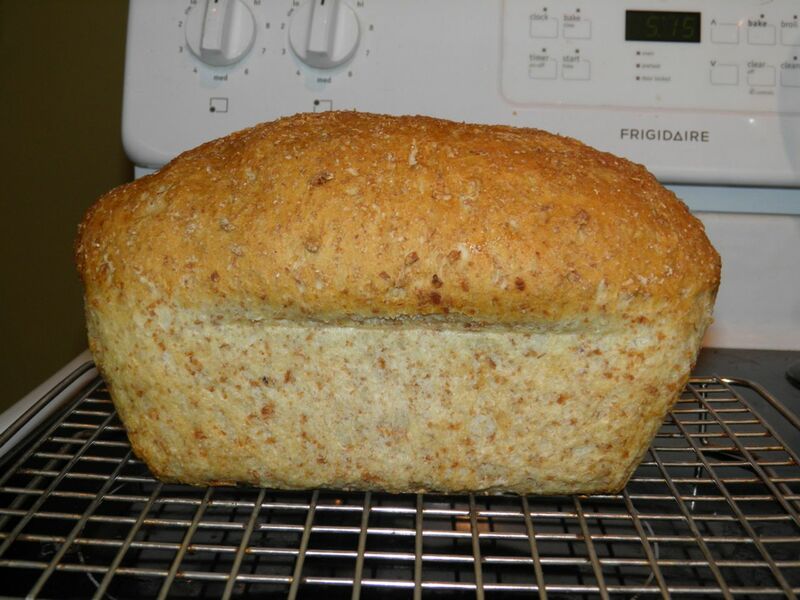 The loaf is done when it is nicely browned and sounds hollow when tapped on top with your fingers. Hi, I saw this bread on Pinterest and it looks great! I was wondering if you've ever tried substituting any whole wheat flour in place of the white flour? Thanks!